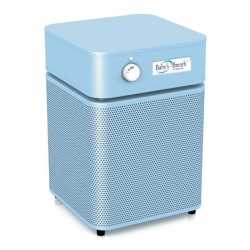 Austin Air HM250 HealthMate Junior Plus Air Purifier is a compact version of Austin Air HealthMate Plus unit with the same Specialty adsorbent. Austin Air HM250 HealthMate Junior Plus guarantees effective removal of VOCs, formaldehyde, ammonia and other specific chemical substances. When to Use Austin Air HM250 HealthMate Junior Plus? Austin Air HealthMate Junior Plus air purifier should be used to clean the air from VOCs and toxic chemicals released by new furniture, new carpeting, fresh paint vapors, vapors from varnish, oil paints, off-gassing from office machines, pesticides, household cleansers, perfume, etc. 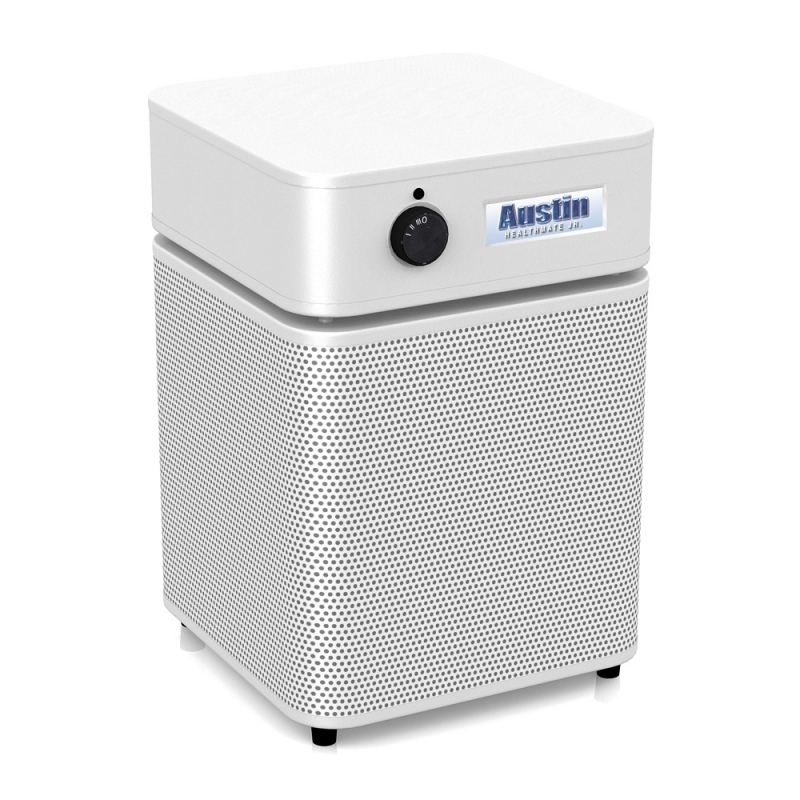 Austin Air HealthMate Junior Plus air purifier employs the same Long lasting True HEPA Filter as the model Austin Air HM200 HealthMate Junior. It traps from the air over 99.97% of all microscopic airborne contaminants down to 0.3 micron in size and therefore, provides a superior level of protection from all microscopic allergens, lung damaging dust, cigarette smoke, and other solid airborne contaminants. Large Chemical an Odor Filter contains 6.5 lbs. of Specialty enhanced adsorbent "Superblend". It contains special additives such as, Potassium Iodide and Zeolite to ensure effective removal of all regular and Specific chemicals, including VOCs. pesticides, cuisine odors, pet odors, formaldehyde, chemicals in cigarette smoke, smoke from wood burning stove, household chemicals, and many more. 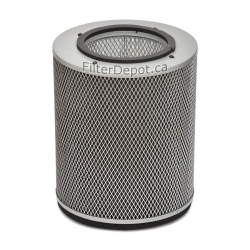 True HEPA filter and Activated Carbon canister in Austin Air HM250 are combined together in One Filter Assembly. The whole filter assembly requires replacement when either True HEPA or Activated carbon filter reaches the end of its lifetime. Standard Polyester based Pre-filter (the first stage of the air filtration system) traps most of larger visible dust and dirt particles and protects fine True HEPA filter from faster contamination. Austin Air HealthMate Junior Plus air purifier employs the same reliable, energy efficient Motor/Fan unit rated at 200 CFM (open air). The 3-Speed control allows the user to set the optimal air flow for any particular air cleaning application, activity or a time of the day. The motor is rated for a long continuous operation at high RPM and a long lifetime. The motor is mounted on shock absorbers, which allows to reduce noise and vibration. 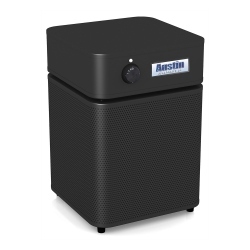 Austin Air HealthMate Junior Plus air purifier features a unified body made out of galvanized steel. The durable, impact resistant the all metal housing features the appliance quality baked-on powder coat. It resists scratching, scuffing and stain. The 360° perforated steel Polluted air intake (lower deck of the unit) helps improve the overall air purifier performance. The Clean air outlet at the top deck of the unit is away from dust and dirt on the floor. Four Wheel Casters on the bottom panel ensure an easy mobility within the cleaning area. Austin Air HealthMate Junior Plus air purifier comes with the comprehensive limited manufacturer's warranty. 5-Year Full Warranty on Pats and Labor. 5-Year Pro-rated manufacturer's warranty on Filter Assembly (under normal residential conditions only). Austin Air HM250 HealthMate Junior Plus air purifiers are shipped FREE of CHARGE by Ground service to all Canadian and US customer from the closest warehouses located in either country. Therefore, there are No Charges or Fees of any kind associated with the Border crossing shipments. There are NO SALES TAX for all US customers. Austin Air purifier purchases by Canadian customers are subject to applicable Sales Tax. Please click here: Applicable taxes to view Tax schedule based on the destination Province or Territory. There are no Other charges or Fees on Austin Air purchases. Amount of adsorbent 6.5 lbs.